Jeremy Paxman, English broadcaster, journalist, and an author is best known as a news presenter and interrogator of BBC 2 programs "Newsnight." He served BBC from 1972 until 2014 and is recognized as question master of University Challenge. His way of raising questions while interviewing is appreciated and criticized as well by politicians. Jeremy Dickson Paxman was born on May 11, 1950, in Leeds, Yorkshire, England. His parents are Arthur Keith Paxman and Joan Mckay Paxman. He is the eldest son and has three siblings. His brother Giles Paxman was the British Ambassador to Spain, another brother, James Paxman is the chief executive of Dartmoor Preservation Association and his sister, Jenny Paxman is the producer at the BBC radio. He attended Malvern College in 1964 and also joined St Catharine's College, Cambridge to read English. Paxman also worked as an editor of the sophomore newspaper "Varsity" in Cambridge and was also the member of "Labour Club." 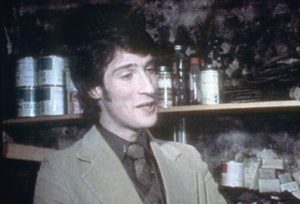 Jeremy Paxman started his career in 1972 as BBC's graduate trainee program. He worked at BBC Radio Brighton. Before working in BBC 1's "Breakfast Time" program, he used to read Six'OClock news for two years. In 1989, he became the presenter of "Newsnight." Once, his pattern of asking a question to political leaders was highly criticized. Some instances are as follows. In the Television show, Newsnight, Paxman asked a Democratic Leader, Charles Kenedy about drinking which he felt that the way of raising question was aggressive nature and non-acceptable for broadcasting. Similarly, during the 2005 general election, many viewers complained to the BBC that his interrogation on the interview is always aggressive and rude. Moreover, he was also criticized for his 5 Am interview with George Galloway, where he asked if he is proud for getting rid of few black women in the parliament. Galloway cut the interview short after this question. Paxman also presented weekly television program review, Did You See? His popular show "University Challenge," made a huge success and was named one of the most viewed TV shows. He appeared in an episode of BBC Comedy, "The thick of it," aired in January 2007. In 2014, he presented "Britain Great War," an accompaniment to his 2013 book, "Great Britain's Great War." He also presented BBC Radio 4 show, "Start the week"(1998-2002). At the end of April 2014, Paxman retired from BBC show "Newsnight," after working for 25 years. 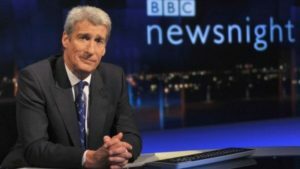 Jeremy Paxman as a news presenter in BBC show"Newsnight." Jeremy Paxman first publication was "A Higher Form Of Killing," a book published on 1982. In 1985, he released "Through the Volcanoes: A Central American Journey." In 2009, he published a book "The Victorians: Britain Through the Paintings Of The Age," accompanied by a BBC documentary series. His recent publication was released in 2016, "A life in question." His recent book is a study of the British Empire: What Ruling the World did to the British. Jeremy Paxman was in a living-together relationship with Elizabeth Ann Clough, in Stonor, Oxfordshire. They have three children without official marriage. After sharing 35 years of togetherness, they get separated in 2016. After splitting from long-term partner Elizabeth, he is currently dating Jillian Taylor, a book editor who helped him to write his best-selling book, British Empire: What Ruling the World did to the British. They are close since 2010. Jillian Taylor is almost 30 years older younger than Jeremy Paxman. 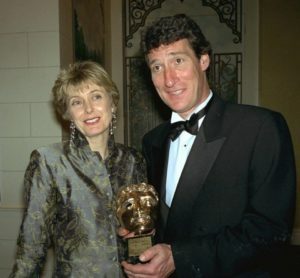 Jeremy Paxman achieved BAFTA's Richard Dimbleby Award for the category of "Outstanding presenter in the factual arena." He also received Royal's Television Society's Interviewer of the year Award for his" Newsnight" interview with Michael Howard. He has won five "Royal Television Society Award" altogether. In 1985, he won International Current Affairs. In 2006, he accepted an honorary doctorate from the Open University. Also, he got an honorable award as an honorary degree from the University of Exeter for achievements in the field of journalism. According to WageIndicator.co.uk, Journalist, Broadcaster and Author, Jeremy Paxman has £1,040,000 annual income and GBP £83,333 monthly income. The father of three is believed to have worth in millions.